Do we actually know that information is available from pings prior to the published 'last ping' at 08.11? I haven't looked into the docs yet (thanks techgeek). How stuff (pings) is logged in the space equipment and then downlinked is probably not covered by the spec. At some point I was afraid logs could have been overwritten (I no longer am). Earlier I reasoned/estimated on technical grounds why i would expect the precision derived of the pings to be better than 5km. I hope I do find something on the precision in the spec. - AND pings form the first two hours of flight (during primary radar coverage) are still in the log. So all pings should be in the log, probably even pings from earlier flights or when the a/c was parked at the gate. Those earlier pings in the log from a definitely known (parking) position can even be used to calibrate the measurement of in flight pings to a better precision. *IF* the precision is actually that good (5km), then taking into account known wind drift and making assumption on a/p settings (FMC versus HDG - Thanks aerobat77 ) and TAS I would expect you can come up with some pretty precise estimations of the flight path. Depending on "which" freighter this one is, it is either apparently 58 meters long, or 81 meters long. Either way, for a displacement hull operating a full throttle it would not make more than 12 knots. There is an upper limit correlated to the square root of the waterline length on a displacement hull after which point you can add infinite power and the hull will not move any faster (you get a huge wake wave, though! ). The more interesting question is: what is a tiny freighter doing way down there? Such smaller boats are typically coastal freighter. Could be a fish-processing or whale-processing vessel. Dunno. Just guessing. Don't count on that crew in those waters to spot any aircraft flotsam. Or spend effort hauling it in. Even more confusion. When the first report about the Maldives broke, i though okay, it must be Somalia then, especially if you extend the satellitte arc around the globe, Somalia looks good. Then i read witnesses saying it was heading north to south east. That will either be it piling into the base at Diego Garcia, mistaken directional awareness of the witnesses or it was a USAF aircraft returning to DG. "Die Berichte von Größe und Farbe des mysteriösen Flugzeugs stimmten mit der Maschine der Malaysia Airline überein." = Reports of the size and color scheme of the mysterious plane are in concordance with a plane of Malaysia Airlines." Last edited by grimmrad; 18th Mar 2014 at 16:22. When the Maldives sighting report first appeared on the Daily Telegraph website, the time was quoted (as far as I recall) as about 0615 local. It also mentioned that it was low enough for the observers to make out the a/c doors. The information is not on the latest update. Surely if the doors were visible, the logo/colour-scheme would be too? Could they possibly mean the lights in the cabin? Would it still be dark in The Maldives at that time in the morning? Surely these additional pings would just give us a series of extra arcs that tell us nothing more than the average speed for each hourly portion of the flight and whether the aircraft was traveling away from or towards the satellite? Somewhere earlier in this thread, a poster who seemed familiar with Inmarsat protocols suggested that the log of SATCOM responses is overwritten with each new response which means that only the final ping data exists. As earlier, hourly pings will only reveal a series of concentric arcs that show no more than that the aircraft was 'in the area', there seems no reason to withhold them. There are reason to not produce them I gave a hypothesis where by I believe it would be possible to show to show it was on a constant track/hdg but have no idea what it was or where in the area it was. However I argue a constant track/hdg is more indicative of a southern route than a northern (nothing to detect them down there. The excellent maps showing the fuel range, satellite 40 ring and Jorn short the southern arc considerably albeit it leaves the most inaccessible section of it as the target. Means nothing, just as Tsu's alleged (and I mean just that) debts meant nothing, scurrilous, the crew are totally innocent until proven otherwise beyond reasonable doubt. This focus on the crew is simply the most convenient way to scapegoat as the media have to focus upon something supposedly tangible. Flash, sadly the crew are tangible whereas person or persons unknown are not. In the case of the former it would be negligent of the authorities not to consider one or both to be culpable. As they are also re-examining the passenger list, and I would hope the cabin crew, they may have additional persons to consider in greater detail. Each range will curtail the final arc. In fact I will modify my previous post to say that the arcs will not even give an average speed of the aircraft unless it is flying to or from the satellite on a radial. In themselves, the previous pings tell us virtually nothing. It's hard to imagine a NON CREW to have the sophisticated knowledge of B777 systems and flying skills to operate with such cunning precision as such. the outer most points of the final arc are based on long range cruise from last radar position. That creates range at time points outwards from last known radar position. If any range from ping arc falls inside the equivalent range from last known position ring it reduces the range from that time. Also if any range from ping arc falls completely outside the range from last known position ring then the aircraft was flying faster than long range cruise and this also reduces the further maximum range. and the same applies for maximum speed calculations and minimum speed calculations. Maybe the Capt had practiced approaches to Male, DG, and other locations because as a keen flight sim enthusiast and 15,000 HR commander who presumably often operated over the Indian Ocean he wanted to see what the approach patterns were for airfields that he might one day need to divert to? All the airfields that people are getting excited about are listed alternates for IOR ETOPS. Chugging around Africa in a C-182 I often check out the approaches and obstacles on possible alternates even if I have no intention of landing at them. It's common sense, not conspiracy. More twisted info. he and his wife had been apart many months and his 3 children are all adults and live their own lives. if you flew at 90deg to the rings the 1hr period would carry you the maximum distance from the previous ring. If you flew at a true tangent to the previous ring the distance from it to the next ring would be the minimum (same distance flown but less distance out from previous ring. If that variance was constant each hour it indicates aircraft on a consistent course but no indication to what that course would be, I did state in the original post way back assuming a constant speed ( as that is what the seem to be assuming. 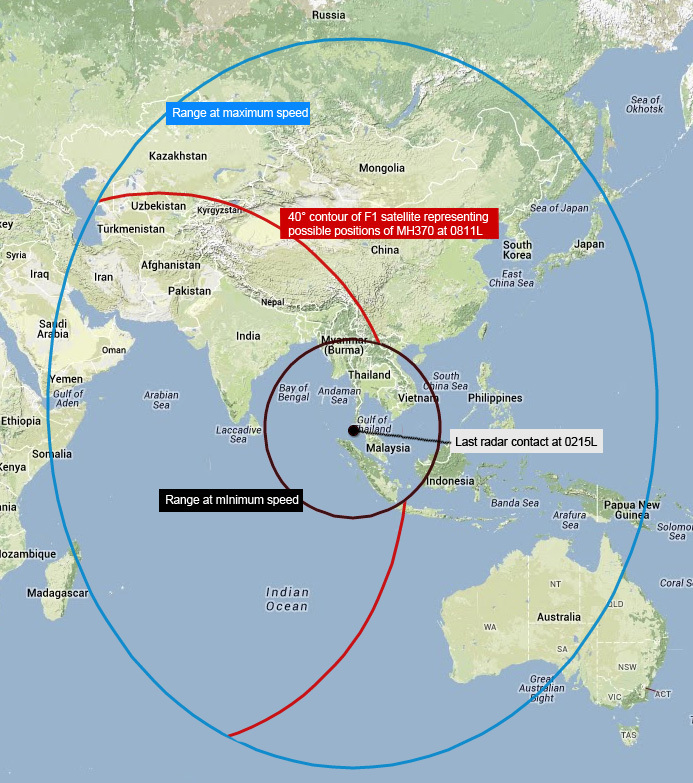 Going back to this lovely map with the arcs and the concentric range circles (http://tmfassociates.com/blog/wp-con...H370_Mar17.jpg) where on each arc would the aircraft had reached if it just continued flying at its last known speed? Would the point of intersection of the southern arc and a circle representing range at last known speed be around the same area the Australians and Kiwis are currently searching? Either that, or it's simply the case that up to now nobody asked the only people (Inmarsat) who were in a position to answer the question. But I'm struggling to see what would be the point of the satellite keeping a log of historical ping acknowledgments, so overwriting old data in a circular buffer makes perfect sense. Even if the previous pings had been available, that would only have provided a set of concentric arcs in a chronological sequence. There would be an infinite number of hypothetical tracks that could intersect the series of arcs. Most likely yes but not necessarily. 1) The difference in distance to the aircraft between consecutive pings is close to the max distance the aircraft could have flown in the time between pings. This would mean the aircraft was flying either directly away or directly towards the satellite. 2) All or several pings measured the same distance to the aircraft. This would mean the aircraft was either stationary or flying exactly along the equi-distant radius to the satellite. If the a/c was in HDG mode it would have followed a loxodrome. Each heading gives a different loxodrom. Simply speaking each of these loxodromes can be seen as curves (not circle segments!) around the point where IOR is in the Zenith. Loxodromes with higher curvature will produce higher differences in ping times. Thus you can derive the heading of the loxodrome. In reality the calculations to fit the loxodromes to the ping and wind data will be quite complicated. Something like this must have been done to get to the courses which are depicted in the press kid from AMSA.